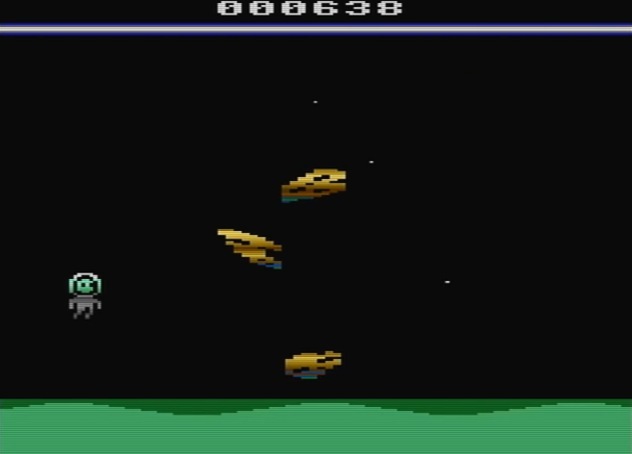 During the early part of this year Pond Software Ltd with SDW Developments released a brand new game for the C64 called ' Spaceman Splorf : Planet of Doom '. Programmed by Andreas Gustafsson, with music and graphics by Vanja Utne and Disk Routines by Per Olofsson, ' Spaceman Splorf : Planet of Doom ' was a C64 high score non stop Flappy Bird style space journey through dangerous zones, that will at some point end your life! That same game has appeared again but this time as an Atari VCS version but with graphical changes specific to the system.